Let’s face it, you’ve been doing it this way for quite some time now. With each and every class your students are growing more tired of your teaching method than a narcoleptic consuming sleeping pills. As you instruct your students to line out their eyeballs roll back in their heads at the thought of more repetitions…. Ugh! Not again, they think to themselves. Sure repetitions are important, absolutely – probably the most important factor in building skill. But mindless reps, reps and more reps without anything but the physical challenge doesn’t stimulate the brain, and can leave students feeling unchallenged. Here’s a simple way to add some fun to basic repetitions, and get the cognitive wheels turning in your students’ skulls. Furthermore it INVOLVES your students in the teaching/learning process. Have your students line out as if they were going to do basic repetitions from their forward stance. Now ask a student for a particular technique (eg. reverse punch). Have the class do 10 reps of the chosen technique, using both sides of the body. Now ask a different student for another technique. (eg. front leg roundhouse kick). Add this technique to the first technique to create a combination technique. Have your students do 10 reps of the combination technique, using both sides of the body. Now ask another student for a 3rd technique (eg. rear leg front kick). Add this to the combination you just created to form a triple technique combo. Have your students do 10 reps of the new combination, using both sides of the body. (In our example this would now become reverse punch, front leg roundhouse kick, rear leg front kick). Of course depending on the fitness and skill level of your class, you can customize this exercise to suit your needs. You could do less reps (say 5 of each), but add more techniques (make a 5 technique combination). I do this kind of thing often with my students, and it helps in many ways. It alleviates boredom for both you and them. It raises the enjoyment level of class because your are involving your students in the process. It challenges even the most advanced students (particularly when somebody adds a spinning hook kick to the combo). 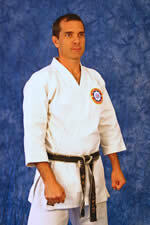 And it can result in everyone discovering new combinations (often by accident) for use when sparring. How else can you modify this simple martial arts exercise to challenge your students and build skill? So a few weeks ago I made the suggestion to expose your students to new training environments, such as the beach or mountains. It’s a great way to keep students’ enthusiasm high and keep them involved with your dojo during the quieter times of the year. 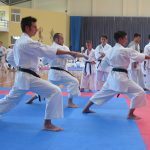 Furthermore it subjects your students to unfamiliar territory, full of distractions and obstacles that challenge their focus, footwork, balance and coordination. 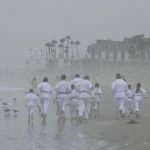 I went ahead and scheduled a somewhat early morning training session for my junior students on the beach at Oceanside here in southern California. Parents and students eagerly arrived at 8:30am full of enthusiasm and wonder, ready to experience what I had in store for them. We wandered down the steps to the right of the pier with the kids’ faces full of excitement, and endless verbal banter to match. I heard students commenting on “how cool this is” and “this is gonna be awesome”. We selected an area close to the water on the sand where parents parked their backsides on deck chairs or on blankets. I called my students over, while parents busted out their cameras. We returned from our little run and again lined out ready to begin. The day was overcast and the water had a bit of chill to it, so I knew it would take a little time for them to adjust. We started our session with basic punches, blocks and strikes from yoi dachi. Then we moved on to oi-zuki and gyaku-zuki from zenkutsu dachi, as the waves lapped their ankles. Next technique was mae-geri (front kick). This is when the laughter began as sand was flicked directly at me and the parents who displayed some nice evasive footwork as they weaved out of the way protecting their cameras. 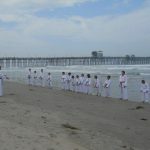 With each new technique I had my students take 2 steps backwards towards the water, and within a few minutes they were up to their knees. The session continued to challenge each and every student as we moved from basics to kata. Uneven ground squishy underfoot, waves splashing against their bodies, and movement hampered by the ocean. Of course there was disorientation for some with no familiar visual reference while performing kata… but all in all students LOVED it! For the next few minutes my junior students countered and slammed their friends into the water with more laughter than you can imagine. 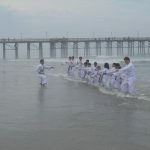 Break-falling into 18 inches of water is now their favorite pastime, and the kids can’t wait for our next beach session.